An activist has just leaked thousands of private messages of an organization that's been known to publishing others' secrets. "The chat is presented nearly in its entirety, with less than a dozen redactions made to protect the privacy and personal information of innocent, third parties. The redactions don’t include any information that’s relevant to WikiLeaks or their activities," Best said. 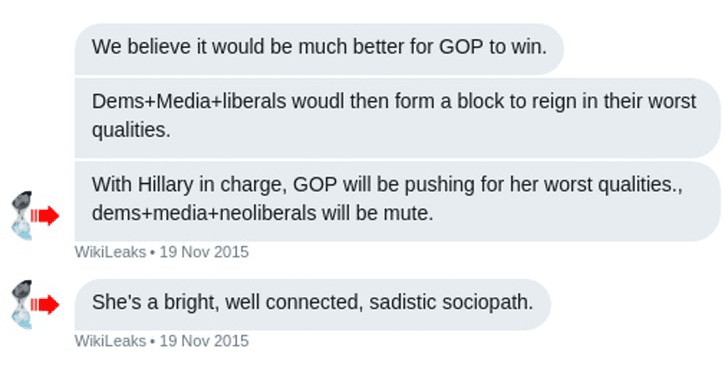 The leaked DMs of the private Twitter chat group, dubbed "Wikileaks +10" by Best, show WikiLeak's strong Republican favoritism, as some portions of the previously leaked chats already showed WikiLeaks' criticism of Hillary Clinton and support for the GOP. The leaked messages sent by WikiLeaks Twitter account likely believed to be controlled by WikiLeaks founder Julian Assange himself, called Democratic Party candidate Hillary Clinton a "bright, well-connected, sadistic sociopath" and said "it would be much better for the GOP to win," in November 2015. During the 2016 presidential campaign, WikiLeaks made public stolen emails from officials of Democratic National Committee (DNC), including Hillary Clinton's campaign chairman John Podesta, as well as documents on CIA hacking tools. "At various points in the chat, there are examples of homophobia, transphobia, ableism, sexism, racism, antisemitism and other objectionable content and language," Best said. "Some of these are couched as jokes, but are still likely to (and should) offend, as a racist or sexist jokes doesn’t cease to be racist or sexist because of an expected or desired laugh." In some instances, WikiLeaks helped direct lawsuits filed by third-parties and even encouraged criminal investigations against their opponents. In others, the chat showed a "mundane consistency with WikiLeaks’ public stances," though a few were "provocative and confounding." "Obama is just a centralizer. He’s bad because representationally he does not look or act like that which he represents. Hillary has similar representation confusion, but she will actively lead the machine to a dark place," one of the messages sent by WikiLeaks on November 19, 2015, read. In response to the Best's post, the official Twitter account of WikiLeaks claimed some tampering may have taken place, saying "the logs appear to have been modified as can be seen by conversational holes (e.g., search for 'Norton') but are useful in other ways." WikiLeaks founder Assange remains in the Ecuadorian embassy in London, but last week reports indicated Ecuador's plans to withdraw its political asylum, and eject him from its London embassy—eventually turning him over to the British authorities.